Thanks for all the telepathic and virtual hugs over the last weeks. My heart is with those who shared their own losses. It’s the hardest thing. 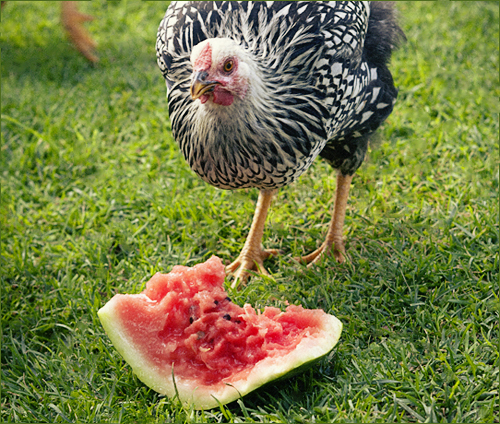 Give chickens a watermelon, and they will give you smiles. 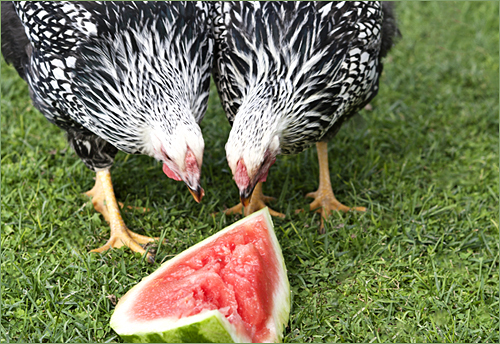 The four black and whites were baby chicks this spring – they’ve grown up! I’ve named them Imogen, Francesca, Diane, and Sally after four of my favorite B&W photographers. Snake, handsome devil, also enjoyed the watermelon. You can see his foot is much improved. I can’t get over how enormous his feet are!! Awwwwww, love the beautiful pics and the color contrasts!!! So happy to see Snake happy and healthy. All the chickens are beautiful!! Wonderful pictures and wow did they ever do a complete job on that watermelon! 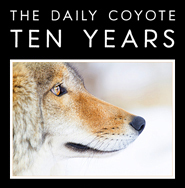 So glad you overcame your distaste for the species. I love the patterns in their feathers, not to mention their colors and best of all their vocal nattering. Any species that is social gets my vote. Love the names! And the grass in the pics is so green and finely manicured…..
Not to be insensitive to Imogen and the girls – but if you ever offer Star Brand Chicken, I’m in. They’re so cute, all of them. Sadly my area has laws about having chickens in your yard. I’d have to have quite an elaborate setup to house the birds. Plus if they happen to be the more vocal sort, I’d probably get fined LOL! 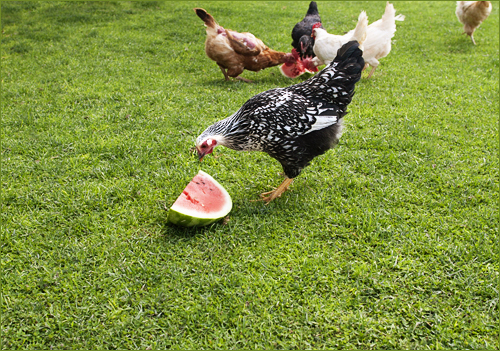 I never thought about chickens eating watermelon. 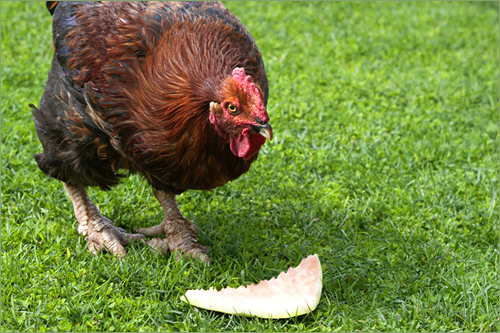 :) Our horses love, love, LOVE watermelon rind. People have taken to just showing up with bags of it for us. lol! They are so cute! And gorgeous. Wow, the black and white ones are stunning! What breed are they? 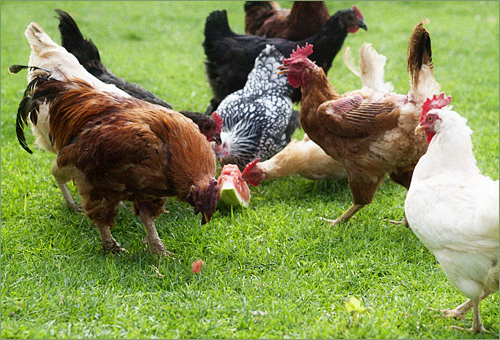 I have to say, I never knew Chickens (and Roosters!) liked watermelon. Do they enjoy all types of fruit? Great shots ! This makes me smile. I have to ask though, how do you tell the black and white hens apart? I love those black and white chickens. Too bad they don’t lay black and white eggs. Snake looks pretty feisty. Back to his ol’ self? Awww they do make one smile! 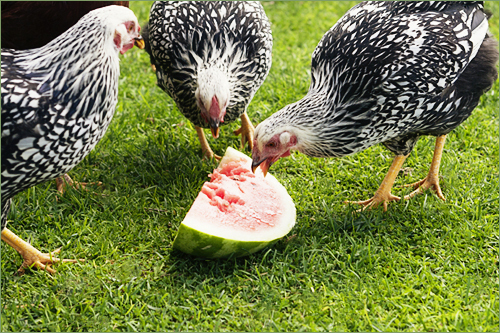 They are loving that watermelon! I hope you’re feeling better! I shed a few tears for all the losses. We lost a co-worker last week in a tragic car accident – looks like a medical situation caused it…. Very jarring. Snake is absolutely beautiful! I will have me some chickens one day. I had planned on skipping the roosters for the obvious reasons, but if they are that beautiful, they might be fun to have around! 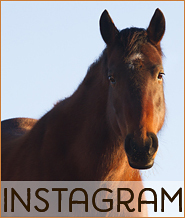 As always, your skill catches the beauty of your animals: their coloring, their posture, their character. I was astounded a year or so ago to find that my city allowed chickens to be kept in backyards; I’d always thought of them as a rural animal. Now one of my mom’s neighbors has some, and I love hearing their clucks and trills from over the back fence. Those are some good looking chickens! 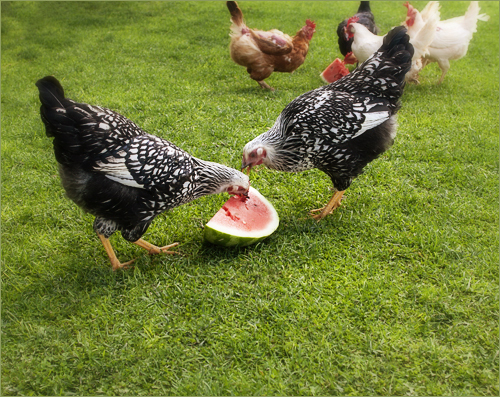 The color contrasts are beautiful…the B&W chickens, green grass and red melon. Great photography! Now there’s something I don’t ever get to see. I’m so happy to have this window into this (yours) other type of living. These chickens are beautiful! Especially the black and white ones. They look like they’re wearing Fleur’s wedding dress. Or perhaps she wore theirs. Jo ~ YES! I think of you every time I open my fridge, then mentally flake by the time I get in front of my computer, back and forth… :( Email headed your way. Love the little rumbly noises they make when they are happy. This is the next series in my TBR pile. I have the first two books already and am waiting on the third to come in so I cam read them bam, bam, bam. I just love it when authors publish three in three months rather than 3 years. This is Nirvana for a book lover. My boys Halloween pumpkins are getting a bit wilty. 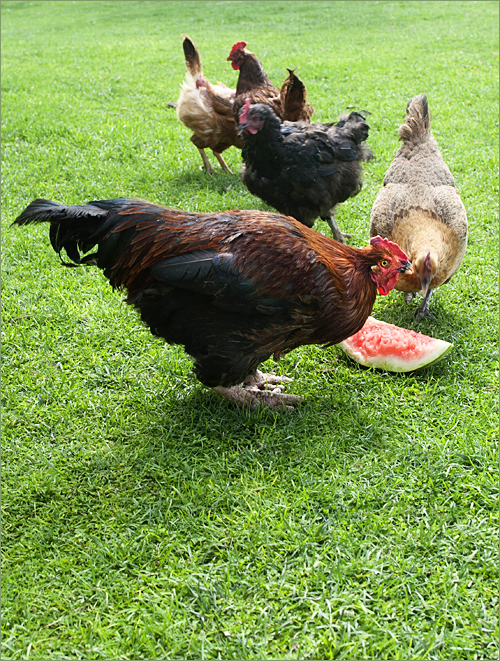 We gave them to the chickens and they love love love them!